Start by melting the coconut oil in a large pan on a medium heat. Finely chop the onion, then add it to the pan and allow to soften. Mince the garlic and add it to the pan, then grate in the ginger, finely chop the red chilli, reserving some for garnishing, and add that to the pan too. Cook that off for around 3 minutes, before then adding in all of the spices. Give everything a good stir together ensuring the onions are coated well and fry it off for a further few minutes. Next, half the button mushrooms and add those to the pan along with the mange tout, allowing them to cook for around 5 minutes, stirring regularly. Then add in the frozen mixed vegetables and whilst those are cooking through, over in a blender add the can of coconut milk along with the roasted peanuts. Blend those together on a high speed for around 30 seconds so that it's not completely smooth with small chunks of peanut. Pour that into the pan, then add in the peanut butter, the Mr Organic Coconut & Turmeric Salsa, the tamari and season it well with salt and black pepper. Give it a good stir together, then turn up the heat so it begins to boil. Allow it to boil for around a minute before then turning the heat back down, allowing it to simmer for around 20 minutes. In the meantime, cook the brown rice and just before serving, add the lime juice to the curry and stir it through. 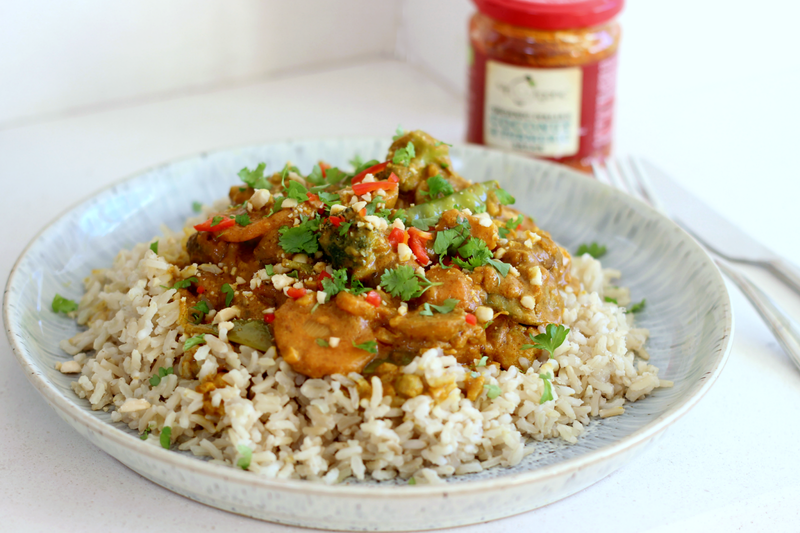 Serve up a bed of rice with a good few ladlefuls of the Satay Mixed Vegetable Curry on top and garnish with some fresh chopped coriander, the reserved chopped red chilli and small handful of crushed peanuts.